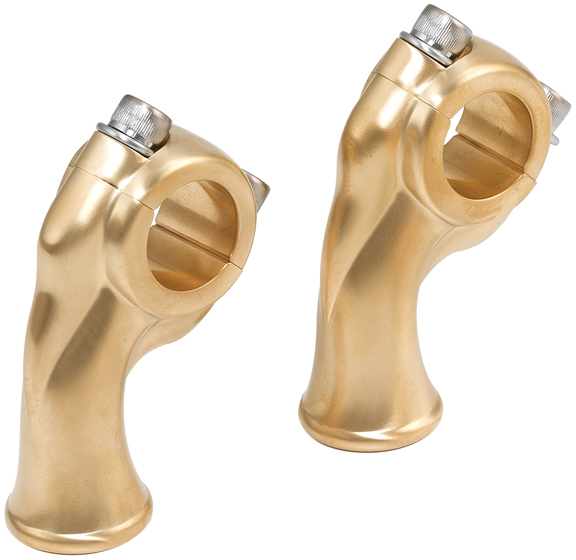 De Luxe Brass Motorcycle Risers are direct replacements for the stock Harley Davidson risers. Of course these chopper motorcycle parts can fit bobbers and most custom motorcycles using 1” diameter handlebars. 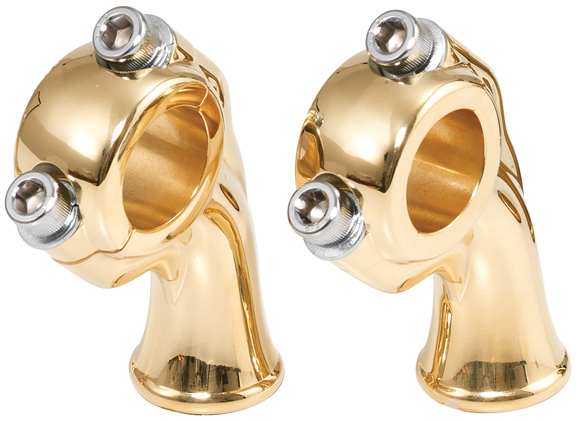 These brass motorcycle risers feature 2.5 inches rise and 1 inch pullback. 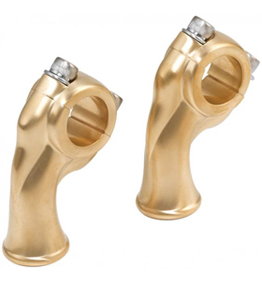 Look great alone or combined with our De Luxe Retro Motorcycle Brass Hand Controls and Nostalgia Carburetor Cover. Sold in pairs. Will these fit a 1994 HD FXSTS? Thank you for your interest in our custom motorcycle risers. Our brass risers will not fit on any stock Springer top triple tree. You would need to replace your stock triple tree with an aftermarket top triple tree for Springers. Wow I have seen this and I have been looking all day. How many of your accent parts will fit a HD Sportster 48, 1200, yr. 2010. Would be neat to see one decked out. If it would be worth it for you and I, please give me a heads up at my e-mail address. Thank you for your interest in Eurocomponents’ Brass Motorcycle Parts. 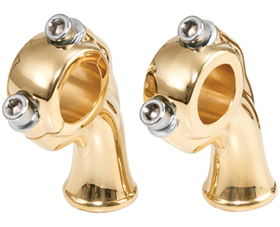 Yes, most of our custom brass motorcycle parts are universal fit and can be mounted also on Sportster models.